Teva says:"Women's specific last, platform and design, the Dalea Mid eVent is a light hiking shoe, which is perfectly suited for casual day hikes all the way to overnight trips. The Dalea provides the grip, fit, protection and comfort to get you down the trail with shoes made for women." 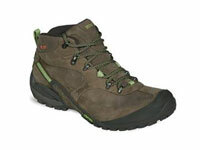 The Teva Dalea Mid eVent is a low cut, attractive looking walking boot. My first observation was the the sizing is certainly on the small side and relatively narrow - I needed a pair a full size bigger than I would normally have in footwear of this type. Once on, though, the Dalea were very comfortable from the off. I felt that my heels were securely held and the generously padded sole, scree and tongue were very appealing. I have worn them during some short (but heavy) periods of rain on mostly grassy or asphalt surfaces during the Autumn/Winter - my feet have been perfectly dry and comfortable. The tongue is bellowed (ie there is some webbing connecting the tongue to the side of the main boot) though I did think this could have been a little longer to really be sure of keeping out very heavy, prolonged rain or snow. The Dalea is cut low which was fine for low level/valley walking but I prefer a higher cut style giving more ankle support for more hilly or mountain walking. Likewise, whilst there is some toe protection, I prefer something more robust for higher level walking or walking on rocky terrain. The Vibram outer sole did a good job in proving traction on wet grass and mud. The external shoc pad (technology which Teva have pioneered in their sandals) did work well over the (relatively soft) terrain on which I was walking. Whilst there is not enough ankle support or toe protection for walking on rocky and/or unstable terrain, the Dalea is certainly a fine option for low level walking over softer ground. You may be particularly interested in these if you have found footwear from other manufacturers a little too wide.